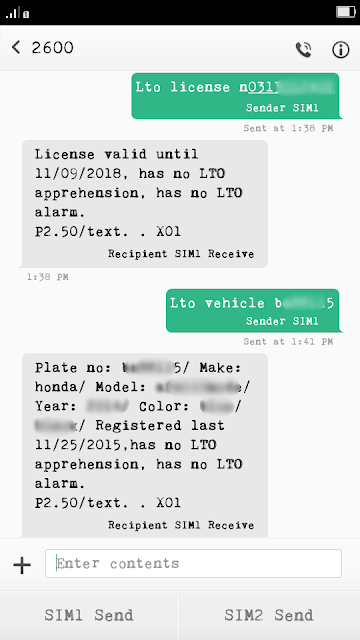 Verifying a plate number and driver's license at Land Transportation Office (LTO) could be a big hassle for ordinary person who has no contact person inside. Most big companies or corporations have their own liaison officer that makes bulk transactions inside LTO office. There's an easier way to verify a driver's license and plate number without living where you are now. That's thru SMS or text messaging using your phone. To verify a driver's license, just type LTO LICENSE [Driver's license number] and send to 2600. Type the license number without a space or dash (-). If your license number is N06-66-666666, type it like N0666666666. It works with any network, like Sun Cellular, Globe Telecom, Smart Communication, Talk n Text, Touch Mobile, and other major networks. Keywords are not case sensitive for both verification. You can type them in all small letters like in the first image or all caps locked. For driver's license verification, information you'll only get are the validity of license, and if there's unsettled alarm/apprehension on the driver's license. 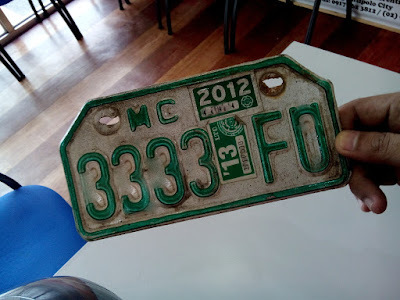 For plate number verification, information you'll get, are the Make, Model, Year Model, Color, last registration, and if there's any unsettled alarm/apprehension on vehicle. Verification costs Php2.50 for each successful verification. Sometimes, in a rare occasion, you'll get a "no record found." SMS reply. The file or record you're looking for may not have been uploaded immediately on the system. It that case, that's the time that you need to verify it yourself on your nearest LTO branch or satellite office. For more information, you may call the LTO at telephone numbers (02)9229061 to 66. How about if only bear temporary plate?